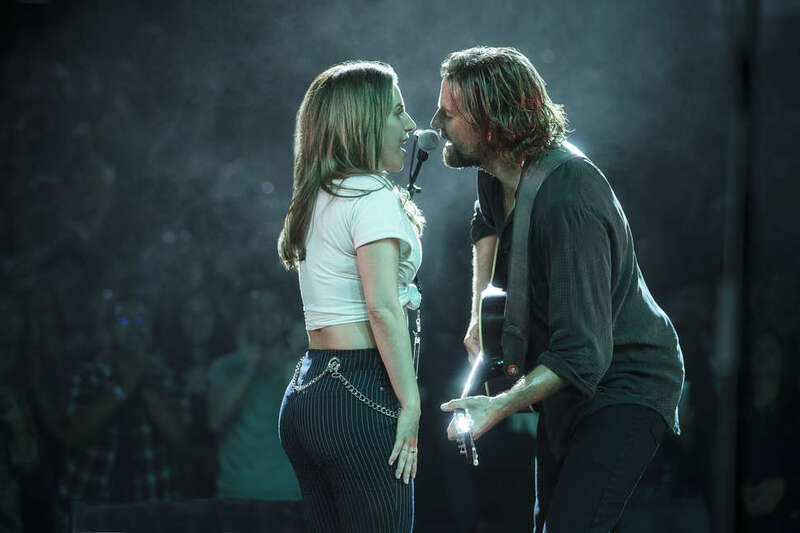 With those words, Bradley Cooper's Jackson Maine walks out on stage at the Greek Theatre in Los Angeles and strums the opening notes of "Shallow" in A Star Is Born, the adaptation Cooper also wrote and directed. Jackson's just told his new love Ally (Lady Gaga, who else?) his plan to debut the song they wrote together during their first meeting at this concert. He needs her to join him. He sings the first verse. Then, with purpose and determination, Ally strides on stage. She almost catches herself by surprise while she's singing to the massive audience. At one point she puts her hands over her face. Just before the bridge, Jackson nods to her. She takes the microphone with a fury and starts belting her memeable pop aria. It's a chilling, indelible moment -- arguably the best in the film. The history of A Star Is Born -- this is the third remake -- is filled with iconic moments. (Think, Judy Garland singing "The Man That Got Away.") "Shallow" is this version's most iconic. "Shallow" finds Lady Gaga once again collaborating with producer Mark Ronson, who she worked with on her 2016 album Joanne. (The other eclectic writing credits on the song include Dirty Pretty Things' Anthony Rossomando and Miike Snow's Andrew Wyatt.) But that was just the first draft. The song evolved when soundtrack producer Lukas Nelson -- whose Promise of the Real appears as Jack's backing band -- came into the picture. "The way the song was different than the way it turned out [was] once we put my band and the musicians [to it]," Nelson says when Thrillist speaks with him at the Toronto International Film Festival. "I wrote that little intro." That "little intro" is an acoustic guitar riff inspired by Eric Clapton. It's a mellower melody that makes Gaga's impressive belt all the more striking. Nelson explains that they would start off in the studio before putting it to film. "Gaga came in and helped direct the band, my band, for 'Shallow,' and so we really produced that together," he says. "The moments, the crashes of the cymbal, we did that live in the studio based on the vision that we had." Not only does "Shallow" feel like something of an instant hit -- and a nearly guaranteed Best Original Song Oscar winner -- Nelson takes a special pride in it. "I'm most proud of my band's performance of that piece in the whole movie," he says. "I think Bradley sang the best on that song for sure. It was his best vocal performance. That, or 'Maybe It's Time,'" which was written by Jason Isbell. 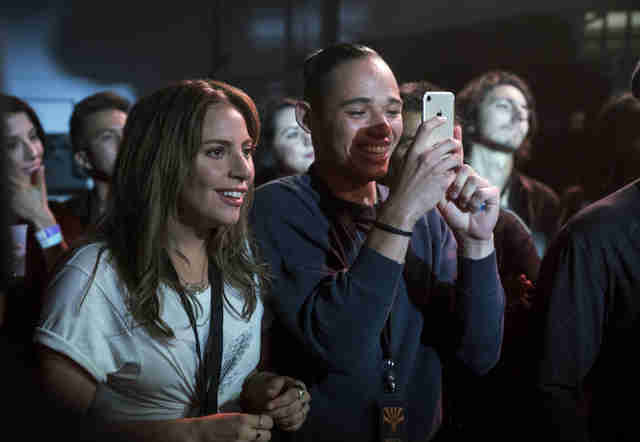 To film the "Shallow" sequence, Cooper packed the Greek, an outdoor venue in Los Angeles' Griffith Park, with about 2,000 of Lady Gaga's fans. So, basically, it was like being at a Gaga concert, Anthony Ramos, who plays Ally's best friend, told me at TIFF. Ramos' character Ramon works with Ally at a catering company and ditches the job with her to get on Jack's private plane and head to the show. When she goes on, he watches in awe. That's not a difficult emotion to conjure when you're watching Stefani Germanotta -- Gaga's real name, and the one Ramos sometimes drops. "In short, was amazing," he says. "It was electric in there. People just wanted to see Stefani sing. It was wild to see. You see this group of people who want to see this woman win. They are like, 'Oh Gaga, Gaga,' but it's also as Ally, her character. She's getting up there and she's being this person. And they get to see her do this. It was dope to be in the wings and watch that and be a part of that." In downtime from shooting, Lady Gaga came out and entertained the audience with her own songs. "Stefani performed like three songs on the piano acoustic for everybody. She went in and sang and killed it," Ramos remembers. Nelson and Promise of the Real also did some of their originals. "It's a nice bridge between all styles of music, and really making it more about the soul of music rather than the genre of music is a great theme for this movie," he says of the experience. These interludes from Gaga were energizing, Ramos recalls. "That stuff is what keeps you going," he says. "That stuff is when it's like 2 in the morning on set and you're trying to go home and everyone is so tired, and then she gets on stage and she just crushes. You're like, yo, hold up. I got a second wind." In other words, you're ready to dive in.